When you look at the romantic-comedy genre today, you’ll see movies that have no soul and basically have the same cliches and characters that just get redone in a different setting. But now, a rom-com based on a true story has just revitalized the genre and has made me keen to see if movies like this will start to make a change to the genre. 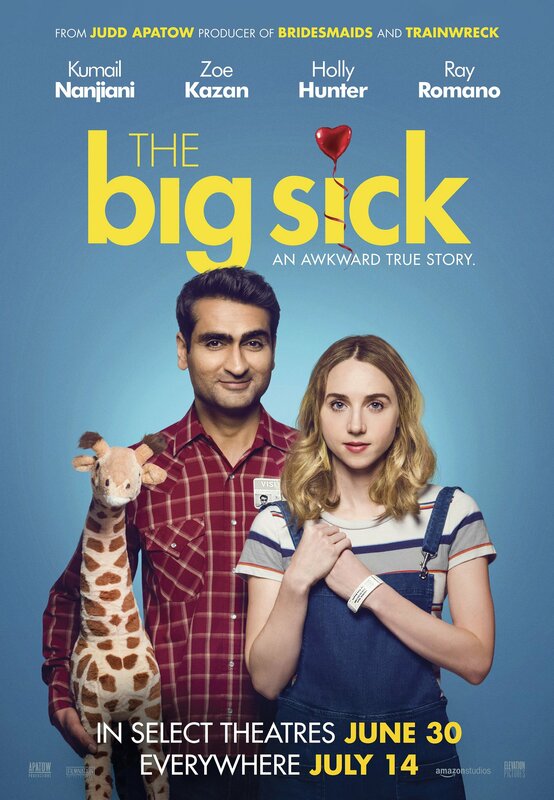 ‘The Big Sick’ starring Kumail Nanjiani, Zoe Kazan, Holly Hunter and Ray Romano, is a sweet and heartfelt take on the rom-com genre and is based on the true story of Kumail Nanjina and his relationship with his wife Emily V. Gordon. It follows Pakistan-born comedian Kumail (played by himself) and grad student Emily (Zoe Kazan), as they start to fall for each other. But after they start to realise that their cultures clash and Emily contracts a mysterious illness that puts her into a coma, Kumail is forced to face Emily’s parents, his own family’s expectations and his true feelings. First of all, I didn’t expect to like ‘The Big Sick’ as much as I did. It really took me by surprise as I was expecting a typical rom-com. But this isn’t your average rom-com and I really appreciate that it’s a different kind of rom-com. This is most likely due to the real-life aspect of it and the talent behind it, which I will get into now. The performances from the entire cast are excellent. Kumail Nanjiani is hilarious here as he plays himself. He shows us the type of person he is and after seeing him in the tv show ‘Silicon Valley’ for a few years, I could tell that he was going to be a great comedian and this proves it. This also brings me to Zoe Kazan, who is also amazing here. Although she is in a coma for half the movie, she is both hilarious and entertaining to watch as a sort-of-fictionalized version of the real-life Emily. Seeing their characters blossom together is one of the best parts of the movie and both of them have great chemistry with each other which is why the movie works so well. If they didn’t have that chemistry, this movie would have turned out completely different. Holly Hunter and Ray Romano are also amazing as Emily’s parents. Their relationship becomes an important part of the movie and it works well. Same as the way they act towards Kumail when they first meet him. It’s both funny and heartbreaking and it’s just great to watch. But personally, it’s good to see these two in a good movie again where they really get to shine. Everyone else is also great, but there are so many other actors that it would take me ages to talk about them, so I’ll just summarise by saying everyone is brilliant. The script is also brilliant. As it was written by both Kumail Nanjiani and Emily V. Gordon, it’s a realistic portrayal of what they both went through. The dialogue is realistic and it’s some of the best this year. It also manages to be both funny and heartbreaking and this makes it one of the most unique movies of the year. One of the biggest positives that I had with ‘The Big Sick’ was its unique structure, especially the second act. The first act plays out similarly to an average rom-com, but better. But it does lead to the amazing second act which feels weird to say, since the best act of a movie is usually the first or third, very rarely the second. It’s one of the strongest acts of a movie I’ve seen in a long time and so much character development happens here that makes it the best act of the movie. It’s just something you have to see to believe. The only real negative I had with ‘The Big Sick’ is that it could have been trimmed down by about 10 minutes, maybe five. As there are a couple of times where it does drag on just a little too much and it would have been fixed by trimming it down by a few minutes. Overall, ‘The Big Sick’ is one of the best romantic comedies I’ve seen in a very long time. From the amazing performances, the beautifully realistic script and a unique structure, ‘The Big Sick’ is a hilarious, yet heartbreaking movie that stands out as one of the best in the genre.